In 1994 the first trail was built through the Meadowbrook Playfield. Since that time a lot of students, work parties, walkers and Community Center attendees have traveled the trails. Now for the upgrade. The North Orchard trail (south side of the Meadowbrook Creeklet) meets a bridge and then connects to the east-west trail. The east-west trail was improved with the help of Ryther Child Care youth back in 2003. It also connects to the Community Garden on the west end of that trail and the Community Center on the east end. 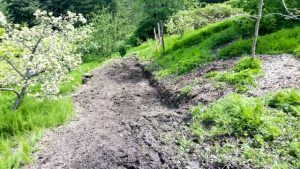 In 2016 the Meadowbrook Community Center’s Advisory Council (made up of local citizens and the Seattle Parks Coordinator) acted on the safety issue of the North Orchard portion of the trail. 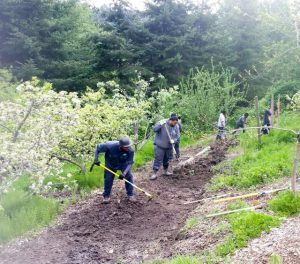 The Council also wanted to offer a safe and welcoming upgrade to the NE 105th trail that opens at the at the Edible Hedge. The plan is to have all work completed in early June. The completion will aid seasonal maintenance in the North Orchard and be set for general use once the Fall and Winter rains arrive. 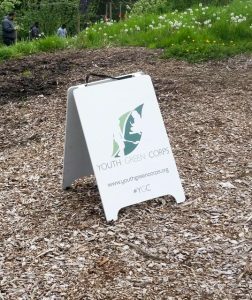 Special thanks to the Youth Green Corp and the ‘Trails Guy’, at Seattle Parks. Wider, drier (eventually) and safer.